For the past several months I have been sharing stories of buildings with high energy consumption and poor comfort that CCG was able to turn around. It is time to share the story of a project that was well-planned and where the plan was well-executed. In 2005 I was approached by Paul Smith, then Business Manager at Hudson City Schools, and Chuck Schilling, Director of Facilities at Hudson City Schools, about joining an ‘Energy Team’ focused on the construction of their new Ellsworth Hill Elementary school. While called an Energy Team, the focus was on much more than energy. The team discussed the diverse use of the building, building envelope, daylighting, low flow bathroom fixtures, easy-to-use mechanical systems, proper temperature and humidity set points, equipment life, system maintenance, and the list went on. Paul and Chuck understood what Total Cost of Ownership (TCO) meant and used TCO as a guiding principle in their design and purchasing of systems. It was enjoyable to work with a small group of people that understood and appreciated the importance of the mechanical and electrical systems on the comfort of the occupants, the life of the building, the efficiency of the systems, the maintenance of the systems, and the overall value of the facility. What was really great is that everyone checked their egos at the door and did what was best for the district. Decisions weren’t made to further any personal agendas. Hudson trusted their team and their team produced on their behalf. Today, 11 years after the building was occupied, it continues to be one of the most comfortable and efficient buildings in the country. The building’s monthly Energy Star rating bounces between 99 and 100, with 100 being the highest rating in the Energy Star program. The Automated Logic WebCTRL system that CCG installed uses a thermograph to show the deviation of the Actual Room Temperature compared to the Room Temperature Setpoint. The color green means the room temperature is ideal and right between the zone’s heating and cooling setpoint. 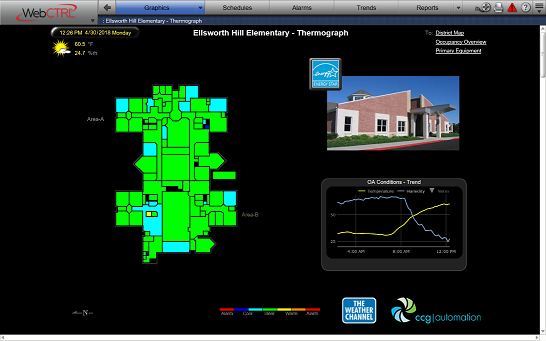 Whenever I log into Ellsworth Hill Elementary to use it as a demo for a prospective customer, I am confident that almost all of the rooms will be green – and the ones that are outside of this ideal band will only be tenths of one degree away from setpoint. Hudson City Schools is currently designing a new Middle School. I look forward to working with Chuck Schilling in his new role as Project Manager for the construction project. Paul has retired and moved on in another capacity helping districts. I don’t like to wish time away, but I am looking forward to seeing the first year’s utility data and the Comfort Index proving the value of an Energy Team – focused on the customers best interest - once again. It’s no Secret - When you have an educated team that works together collaboratively – anything is possible.